One of the nice advantages of living and working in the Fort Collins, Colorado area is that we have a large number of large breweries and craft breweries close by to visit. I took the opportunity for a long lunch break from work to visit a small brewpub and restaurant in town by the name of Coopersmith's Pub and Brewing. 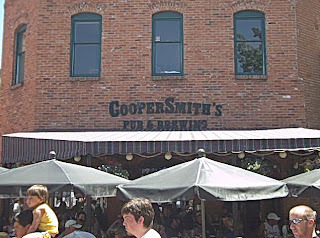 Coopersmith's is nestled in the heart of Old Town in downtown Fort Collins. This restaurant and brewery is split into two separate facilities. One is their restaurant / brewery called Pubside and the other is a pool hall just across the walkway and is called Poolside. Coopersmith's makes beer on both sides of their establishment. Over 18 styles of beer are available including their own brand of cider. Seeing how I still had to go back to work that afternoon, there was no way I was going to be able to try all 18+ beers that they offered, so I settled on a sampler of five different beers. Coopersmith's offers a small 5-oz sampler size for $1.95 each, but if you order 5 or more of their samplers you get a discount. My 5 beer sampler cost $8.00. Among their list of beers that were available, I chose to try the following: Albert Damm Bitter, Columbine Kolsch, Marzen Lager, Punjabi Pale Ale, and Horsetooth Stout. Our server lined up these beers from lightest to darkest. I chose to try these beers a bit out of order this time around and went for an IPA first. I'll admit that I'm still developing a taste for IPA's but wanted to give the Punjabi Pale Ale a good tasting without being influenced by the other beers first. The aroma of the Punjabi Pale Ale had the usual hopped up goodness I was expecting. This beer was reddish in color. It was very tasty and not overly bitter like some IPA's can be. It was also a tad sweet which was a nice surprise. This IPA was quite good. Even my friend who had never had an IPA said that he enjoyed this beer. It was good smelling and had a nice balance between the hops and malts. This beer was 6.8% ABV and was just right. 3.4 out of 5. The next beer I tried was the Marzen Lager. This beer is supposedly a classic German springtime lager and was made from Pilsen, Munich and Honey malts. The beer was amber in color, similar to the IPA. This beer's taste sneaks up on you. At first sip you don't really taste much but then a few seconds later the malts hit you. I'd almost call this beer Delayed Reaction. This beer came in at 5.8% ABV. Even after several sips, the malts don't hit you right away. This beer is also slightly sweet but is balanced with a hint of darker malts and German noble hops. Tasty. 3.3 out of 5. The 3rd beer of the sampler was the Albert Damm Bitter. This is described as a more traditional style session ale with a generous kettle hop addition. This beer was also amber in color and came with a nice creamy head. This smelled good but upon first sip it wasn't nearly as bitter as I would have expected. In fact this beer seemed a tad on the watery side. I could also detect a slight bubble gum like taste to it. This just wasn't what I was expecting from a Bitter. Meh. 2.9 out of 5. The 4th beer was the Columbine Kolsch. I've become a fan of Kolsch beers and was looking forward to drinking this beer. This was a pale yellow color with a short head. It smelled somewhat like a wheat beer. The first sip was almost what I expected a Kolsch to taste like but then I was struck by a very weird aftertaste. I had never tasted anything like that before and was at a lack for words to describe it. It wasn't a very pleasant aftertaste and left me with a puzzled look on my face. It almost was like a spoiled wheat. This too had a bit of bubble gummy taste to it but with something else that hit the middle of the tongue. 5.3% ABV. This was not a good example of a Kolsch and I didn't want to finish it. 2.6 out of 5. I saved the darkest beer for last, their Horsetooth Stout. This oatmeal stout is named after the mountain and reservoir west of town. This beer was black with a nice head. This beer was supposedly nitro infused at the tap but I didn't see any cascading bubble effects in this glass. This beer had a nice aroma of darker malts. The taste was smooth. Not too much on the coffee side but just enough to let you know that this was a beer with a lot of good dark malts and oats. 6.2% ABV. The malt taste hits you a second later after tasting it. I liked the balance of this stout. Enjoyable. 3.2 out of 5. I was slightly surprised that I ranked the IPA as my favorite of the session. The Marzen and Stout were a close second. The pubside area was filling up quick with locals. I'm glad we got there a bit early for lunch. I ordered a buffalo burger with pub chips to go along with my samplers. It was a good choice and helped to clear the tongue between tastings. Between the samplers and the food plus tip, it cost me $20 for this lunch. A tad on the pricier side but in my opinion was worth it. I didn't have time to go over to the poolside for a game of billiards but look forward to visiting Coopersmith's again to try out more of their beers. Worth looking for when you come to visit Fort Collins and go brewery touring. - 2009 Colorado Brewers' Festival highlights. - Odell Brewing officially breaks ground on expansion.